Skin MD Natural is offering our readers a giveaway of a full-size bottle of Skin MD Natural Shielding Lotion, an $18 value. Until technology catches up with me, you’re going to have to read about Skin MD Natural here. 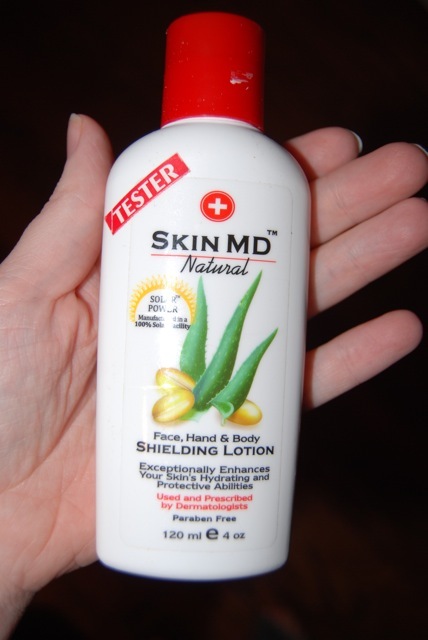 For the last 2 weeks, I’ve been using Skin MD Natural Shielding Lotion. The product’s description claims it works as a shield to keep in the body’s natural moisture as well as keep out irritants that dry skin such as soaps and cosmetics. I use both of those products liberally so I was ready to give this a shot. Using 93% natural ingredients, the top 2 ingredients are water and aloe vera. My first impression was the lack of odor. Ok, I know most people call it “fragrance” or “scent.” However, if you get headaches from every day products that contain these “scents,” you would call them odors too. It has the scent of the ingredients and, fortunately for me, none of those ingredients are perfumes. My second impression was how thin it was. I’m used to petroleum based dry skin treatments so this was a surprise. It meant that a little went a long way but I was concerned that the coverage was too thin to make a difference for my skin. Time would tell on that. Following the directions, I applied it regularly for the first few days. I don’t think I went more than 4 hours between applications except for overnight. I used it on my hands mostly but also on my feet, knees and elbows. In the morning and at night, I used it on my face. I used it on my entire body after bathing. In other words, I used it a lot. The promise on the bottle was that after using it liberally until the “moisture level improves,” I would only need it once or twice a day. Remember how I said I wish I could capture itching and tightness on camera? And then how I wanted to capture the relief of both on camera as well? That would be handy right now because it’s hard to put into descriptive language except to say that within a week, I felt less tightness and less itching. For those who know the uncomfortable tightness and the irritating itching, I don’t need any more words than that. Those who don’t know it are unlikely to be reading a review on lotions. The biggest downside to the product is the price. Skin MD Natural costs $18 for a 4 oz bottle. I thought the price was exorbitant, which is mostly because I’m cheap as it doesn’t seem out of the ballpark for a natural product. However, after I used the product for 2 weeks and still had half of the bottle left, I realized the cost wasn’t that high for the amount of product. Did I mention how often I used it? A 4 oz bottle will easily last a month and, if your skin isn’t as thirsty as mine, perhaps even 2. Keeping Skin MD Natural handy! If you have a specific skin condition and wonder how and if Skin MD Natural will work for you, visit their website section on skin conditions. The product gets rave reviews from me but even more so does the company. They do no animal testing and use 100% solar power. Skin MD Natural is a lotion that has been recommended by over a thousand doctors and dermatologists for dry skin, eczema, and psoriasis. Because it’s a shielding lotion, it assists the inner layers of skin to absorb moisture. The unique humectant (an ingredient that attracts moisture) has been laboratory tested to be 6 times more effective than any other you will find in common creams. [Editor’s note:] Sounds like it would also be great for those of us washing our hands umpteen times a day from changing diapers and cleaning up after kids! You can also order online directly from SkinMDNatural.com. You can find the lotion online at Amazon as well, where it’s eligible for free Super Saver Shipping. A single bottle costs $18. For your own chance to win a full-size bottle of shielding lotion from Skin MD Natural, enter in the comments below! Contest is open to U.S. & Canada. Head on over to SkinMDNatural.com and tell us something you’ve learned! Tell us why you need this shielding lotion! Sign up for the Healthy Skin newsletter. Follow @SkinMDNatural on Twitter and leave your Twitter name in the comment. Like Skin MD Natural on Facebook. Subscribe to Skin MD Natural’s YouTube channel and leave your YouTube user name in the comment. Watch one of the videos and tell us what you learned! Contest closes March 3 at 11:59 p.m. PDT. Our reviewer Charlie tested this product for Natural Parents Network. I learned that daily use of soaps and cleansers can greatly reduce your skin’s natural ability to repel the thousands of irritants and toxins that are commonly found in the home and work place. I have the driest skin ever – esp. 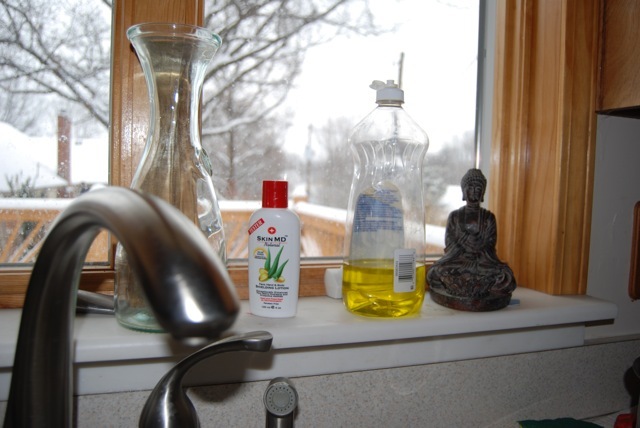 in the winter – I could use some help moisturizing my skin and keeping myself hydrated. I learned it lasts a good portion of 8 hours with one application. I need this because wintertime drdies out my skin so badly and my hands begin to crack and hurt. I need this lotion b/c I have very dry skin & psoriasis. I was most impressed when I checked the ingredient page. I saw the list and thought “yep, a lot of that is greek to me!” But then I scrolled down and saw a picture to represent each ingredient AND an explanation of what it was and why they use it! That is SO cool! Then at the bottom, they even thank the reader for being an educated user! My husband has a skin condition so I would love to see how this might help him. Our toddler daughter also suffers from dry, calloused spots on her toes (starting on her heels now, too). Our doctor has us lotion her feet and keep her in socks. She prefers to go barefoot (like her mother). I’d like to try this lotion on her, too! I left a relevant comment on this week’s Wordless Wednesday: Natural Learning. 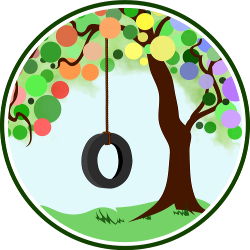 I have the NPN badge on my blog = 2 extra entries. If you click my name here, it will take you to my blog. I left a relevant comment on Set Yourself Up to Succeed. I learned the once the outer layer of skin is damaged that is when you encounter problems with allergies and eczema.